Florida Keys: A Mediterranean Inspired Brunch at Azur Restaurant. Disclosure: Our food was covered by Azur Restaurant and The Florida Keys. All opinions are my own. A dining experience at Azur Restaurant will be a memorable one. 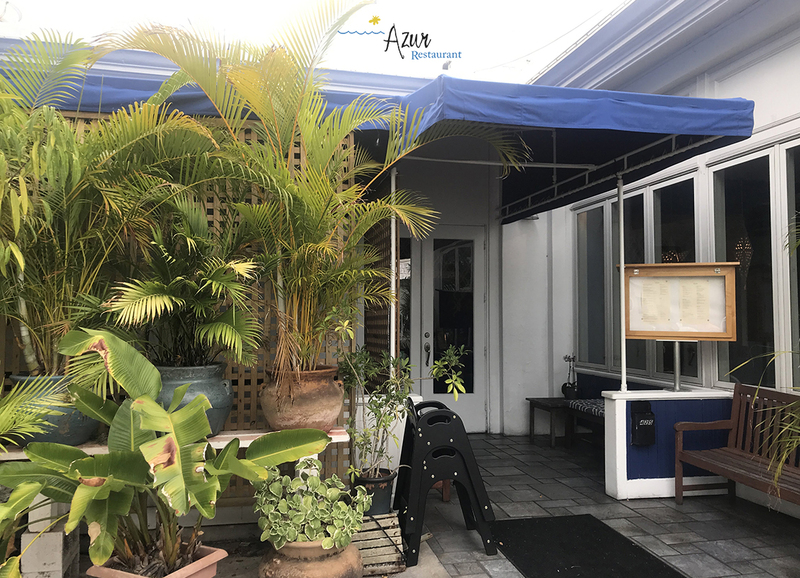 Located in Old Town Key West, Azur is open daily for brunch and dinner. Their brunch experience is amazing! If you are in the mood for a Mediterranean inspired brunch, then Azur Restaurant is the place to be. Chef Michael and Chef Drew infuse seasonal recipes and ingredients in all of the recipes they make, creating a wonderful and wholesome menu that is sure to please even the most pickiest eater. And trust me when I saw this… because I am a very picky eater! We started off our brunch with selections off the Old World Breakfast art of the menu. First was the Azur Continental dish, consisting of Artisan rolls, croissants, muffins, and fresh fruit. The baked goods were very fresh, and the fruit was nice and cool. Next came Greek Yogurt with Thousand flower honey, fresh seasonal berries and fruits, and granola. I took small taste of the in-house made granola and berries, as I wanted to save room for what was to come. Moving to the Hearty Breakfast portion of the menu, Chef Drew brought out Azur’s very popular Braised Beef Rib Hash and Eggs. Now we were sharing these dishes, but I could have monitored through this one myself. The beef was soft and tender, the potatoes were perfectly cooked, the poached eggs were on point, and the black truffle hollandaise was amazing. This dish was incredibly delicious, and I highly recommend ordering it. Next up was something I requested – Eggs Benedict II. My go-to breakfast item on any brunch menu is Eggs Benedict, as it is one of my favourite dishes. Azur uses a grilled ciabatta in place of an English muffin, so there is a nice crunch when you cut into it. Another home run here folks. Try it – it’s amazing! Our next brunch dish was Azur’s popular Carbonara Breakfast… linguine, pancetta, button mushrooms, caramelized onions, cream, Parmesan reggiano, and poached eggs. Cut the eggs, and let the yolks run wild over this dish… it is incredible! I don’t even know what to say about the final dish Chef Drew brought to us – Key Lime Pie French Toast. Tart and sweet slices of Key lime pie, wedged between Texas toast grilled in vanilla custard, with a wild berry compote. We almost licked the plates, it was that good. We got a taste of a good portion of the brunch menu, and nothing disappointed. Chef Drew and team knocked it out of the park with everything they served us. Azur Restaurant has a wonderful brunch menu, filled with items sure to appease everyone’s appetite. If it is a traditional breakfast you are looking for, Azur offers that. Traditional Breakfast: Two farms fresh eggs, Yukon gold home fries, ciabatta toast. Choice of whole-hit sausage links, Applewood smoked bacon, Italian fennel sausage, smoked honey ham, fresh fruit. If you are looking for something special, here are the rest of Azur Restaurant’s brunch offerings. Azur Continental: Artisan rolls, croissants, muffins, fresh fruit. Braised Beef Rib Hash and Eggs: Slow-braised beef rib, Yukon gold potatoes, poached eggs, black truffle hollandaise. Carbonara Breakfast: Linguine, pancetta, button mushrooms, caramelized onions, cream, Parmesan reggiano, poached eggs. Key Lime Pie French Toast: Texas toast grilled in vanilla custard, Key lime pie, wild berry compote. Apricot-Almond Oatmeal Brûlée: Steel-cut oats, almond milk, apricot, crunchy brûlée, fresh berries. Eggs Benedict II: Poached eggs, sautéed spinach, honey ham, grilled ciabatta, hollandaise. Azur: House cured fennel salmon, shallots, crème fraîche, capers, tobiko hollandaise. Yellowtail Snapper: Local yellowtail, grilled ciabatta, spinach, caper hollandaise. Rosette: Potato pancake, brie, prosciutto, arugula, hollandaise. Toasted Gnocchi: Smoked bacon, caramelized onion. 4 Cheese And Egg White: Baby arugula, truffle. Monte Cristo: Smoked ham, turkey, Swiss cheese on Brioche, fried in vanilla custard, served with currant jelly and fresh fruit. Breakfast Ciabatta: Applewood-smoked ham, scrambled egg, assuage cheese, beefsteak tomato, romaine, salsa verde mayo, served with fresh fruit. Angus Beef Burger: House made pickles, smoked paprika mayo, grilled onions, fried egg. French Dip: Braised beef rib, asiago, apricot mustard, beer-battered onion rings, truffle jus. Nicosia: Olive oil poached tuna, potato carpaccio, French beans, grape tomatoes, kalamata olives, fried egg, lemon aioli. Azur Chef Salad: Mixed greens, smoked turkey breast, nuke bacon lardons, European cucumber, Roma tomato, asiago cheese, green goddess dressing. Greek Salad: Panko fried feta, crisp romaine, cucumber, Roma tomato, red onion, kalamata olives, oregano vinaigrette. You can follow Azur Restaurant on Facebook, Instagram, and Twitter.